The Z3 FILMS Basement: THE ONLY WAY - Special Edition DVD's! THE ONLY WAY - Special Edition DVD's! 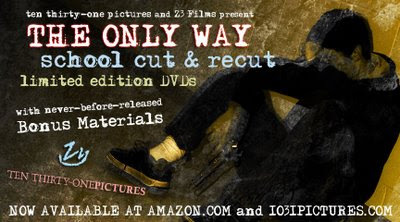 The Only Way is coming out in 2 NEW Special Edition versions on DVD. We will be releasing both cuts separately with never-before-seen bonus material. The School Cut will contain an introduction to the film by Actor Billy Kearney, 5 deleted scenes, and a rare school cut trailer. The RE-CUT version (director's cut) will feature a short featurette that takes you On-Location during the shooting of the Crime Scene sequence, 5 different deleted scenes than the School Cut DVD, and the RE-CUT trailer. We also have a few more copies of the Limited DUAL FEATURE EDITION, this contains both cuts of the movie but no additional bonus material.